A show that much be watched! After 3 years Hayate No Gotoku! comes back better than ever. They really uped there game here. The animations are amazing compared to the last two seasons that has passed for example the amazing waterfall that wasn't there in season 1 and 2 . I like the fact that in the first episode a New character is introduced automatically. i like the fact as well that they used the same way to bring together nagi-chan and hayate-kun together was the same way they bought another character together. I believe as well as you can see the first episode starts in a desert in vegas, i hoping that was some type of foreshadowing like they do in most animes, where they show the middle than explain how they got there. MUSIC IS AWESOME!!! The Intro is alright compared to others i have seen. If you watched the first and second season and enjoyed it, you will enjoy this as well. I know that there is a little bit of confusion between the plot of the anime from the plot of the previous season, however I will explain that. While watching this anime you will notice that it is a comedy romance anime with some action involved. It has a great story that is appealing as well. As for the confusion in the anime...you will realize that some things are out of place and off-scenario. That is what you will believe unless you knew when this anime was coming out, in other words, you read the manga. In the manga you will find out the whole scenario of what happened to Nagi and why she is currently the owner of an estate in which similar characters live. You will also learn about important things that happened in Hayate's past, the manga fills in many gaps if you haven't already been reading it and I highly recommend that you do at least read from chapter 177 and up if you haven't already (at this point you will have to read 200 chapters or more to catch up, but its worth it). Back to the anime, it is a fun anime that keeps you interested and wanting more. In this side story you get to see some remembered characters and some new ones that all have great personalities. The animation is much more improved and may throw you off a bit, but is inviting and easy to get used to. The anime also makes use of random humor that is actually funny and acceptable in comparison to the Teekyu OVA that is just random and leaves you thinking WTF after every 2 minutes of stupidity (watch it). The first thought which came to me when i heard about hayate no gotuko getting a season 3 was that, this has got to be one of the best things of the year. Later when it was specified that this was not the continuation of season 2 but will have a completely different storyline deep down i knew hayate no gotuko never let me down in the past and neither will it disappoint me in the future and i got just what i was wanted. Though hayate no gotuko never really had a plot but in this case we get to see an advancement in the story right from the beginning itself which is definitely a plus point from my side .Actually it is said that the original author Kenjiro Hata wrote some of the story based on some ideas that never made it to the manga. So there is no worries about the plot not being true to its nature. The art is probably the weakest point in the anime .The characters look a little freaky in this one but not to worry the expressions are portrayed just as well as ever. The opening and endings are good. They didn't leave a super impression on me but its still good to some extent. The characters in Hayate no gotuko are just as lovable as ever. They have introduced a new character who claims to be nagi's younger sister which is then again part of the proceeding storyline. just as funny and enjoyable as ever. Take it from my side, every episode of Hayate No Gotoku! Can't Take My Eyes Off You has its enjoyable moments. Might lack a little comedy compared to the previous seasons but hey the storyline and those witty characters are sure gonna get you glued to the series till the end. I've watched the entire series from the beginning until now, the 11th episode of season 3. Good to note is that I never read the manga and I don't know how the plot is supposed to roll, but it is my understanding that this season doesn't involve the manga in any way, but I'm going to exempt this fact. Also, I'm using this space to review all three seasons to take some notes, but mostly the third. 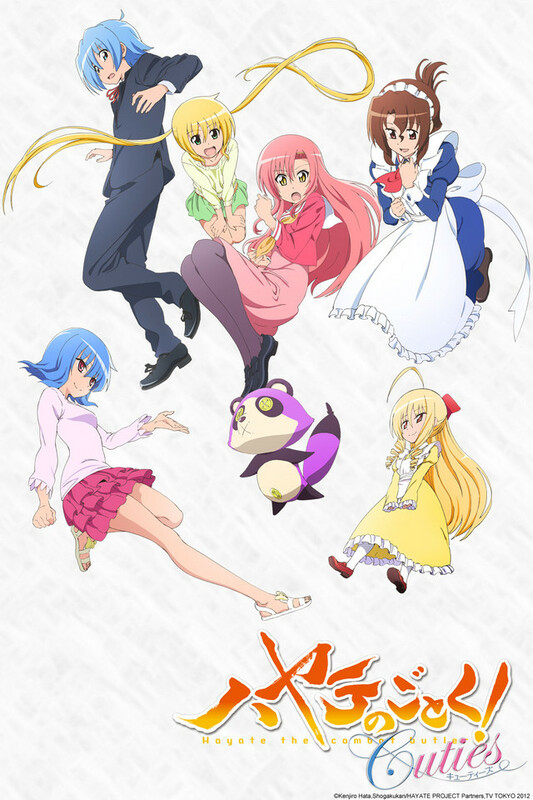 In the first season (52 episodes) it was all just lighthearted fun with bits of love and drama(at Hayate's expense of course), and that's likely the reason the series became so popular. There were many memorable times and the anime took off making its viewers wanting more when the season ended. Season two then began, and we experienced an alternated art style, which wasn't exactly well received at first, but eventually accepted and grown to be liked. The character development of those other than Nagi and Hayate was also well received. Another thing to note with the videos themselves of season one and two, is that there is a LOT of video overlay on this site for past seasons, and if you use Crunchyroll to watch them on either the website, PS3 or mobile app, you will be unable to properly view some scenes, and if you don't understand japanese somewhat, you'll be missing dialogue that could be important as well. I'm just going to point out that in season 2 I became very confused. Certain events that had happened in season 1 became nonexistent, and several episodes were confusing, such as Hinagiku and Ayumu meeting "for the first time", despite them being well acquainted near the end of season 1. It was also apparently forgotten that Nagi and Ayumu were friendly in season 1, during the time where Nagi stayed at Ayumu's place when she was upset with Hayate and also learning what it was like not to be rich. Another clashing incident is Nagi's first public train ride, which was done with Hayate and Maria in season 1, but then repeated with Ayumu in season 2, which may be the most obvious problem between the two storylines. This has caused me to believe that most of season 2 happened alongside the time frame of season 1, showing side stories, or the two seasons were alternate realities that were similar. As I mentioned in a previous paragraph about the transition between season 1 and 2, the art style change in this new season is a huge alteration, and I myself am not a fan. The characters appear more defined and, to me, more unattractive. I'm not sure why they chose the style, despite it being so long since the last season, but I'm not in favor of it. Something I noticed right off the bat is that their mansion is completely different and remodeled, and I thought that they weren't even in Japan anymore. Another thing that's different, to note, is that the characters, while basically the same as before, seem more dramatic than usual, especially Nagi. This is just my personal opinion of course. Plot-wise, I am enjoying the developments following The Black Camellia, and I think they add an interesting twist to the story. That being said though, its made the series much less "fun" and a bit more serious than in the past, kind of ruining its charm, and the reason I stuck with it in the first place. Additionally, I didn't understand who this Ruka was exactly and their relation to the Nagi and the rest of them. They appeared to be acquainted but it's never explained in this season and you wouldn't be able to know anything about her without reading the manga or doing some research online, something which is important to those who don't often read many doujinshi. Also, it seems like the Black Camellia caused a lot of "convenience", where we ended up with all the characters in the same place, which is really stretching how much manipulation the writers can actually accomplish without annoying the viewers. Really pleasing to the ears. Despite not knowing much about Ruka, her performances added well to the insert songs and the end credits. The music choices were well thought out (perhaps better than some other aspects) and fit in almost perfectly to each situation. Another factor well done, although the story seems to be focusing only on Nagi and Hayate most of the time, minus a few scenes and one or two episodes. All the characters retained their voice actors it seemed and they are true to their nature. To someone who read the manga, this score might be a bit high, but to someone following the anime only it's understandable. The current story arc doesn't contradict with any of the events in the previous seasons (as far as I can tell) and is definitely interesting. Out of everything in this anime, the one thing I really despised was the design. Scenery and details in the environment are well done and high quality. However, the animation done on the characters really annoys me. Their faces especially are much more detailed, making most of the characters seem more gloomy, adding a more serious tone to the already less-serious-than-it-should-be anime. Overall its not bad, but compared to previous seasons I am a bit disappointed on how different it is. If you're a fan of the series though, then it's definitely worth it to watch this to see the events unfold. Hayate no Gotoku! Can't Take My Eyes Off You (also known as Hayate the Combat Butler! Can't Take My Eyes Off You) is a separate series of the Hayate franchaise that stands independently written by the author of the manga, Kenjiro Kata himself. Now, this can be both a good or bad thing. Likely, if you're a manga reader, then you'll be very familiar with his works. However, if you're more into the animation product, then brace yourselves. This might be something you might want to keep your eyes on for mixed reasons. The series retains its lighthearted tone of a comedy. Nagi and Hayate stars together as the main protagonists along side their friends. Yup, the gang is back together for some maid and butler fun. The series starts quite slow and Nagi is lazy as ever. She's always been lazy anyways but still retains that fondness for video games and doing whatever she wants. Damn, talk about being a lazy spoiled brat. In fact, a new semester is about to begin and she's still laying down on her sofa. Things does somewhat pick up its pace though as her knight in shining armor (Hayate) comes to her recuse like anyways. The initial episodes of this series seems to be independent despite the title of the series. It's sort of misleading as “first night, second night, third night” as one might expect some sort of chronically linear story. However, most of the first half doesn't seem to connect much. Furthermore, it introduces a new character who comes under the claim to be Nagi's little sister. It's hard to take her seriously with her personality. In fact, it's hard to take this series seriously at all with the themes, cliches, and gags. Although it does brings back some nostologia from the original series, it's starting to lose its touch especially for die hard fans from season 1. It doesn't help by the fact that there are even a few minor fillers in between. As painfully it may seem, it's there. However, there is some good news. A certain strawberry colored hair council president makes her return in this series along side some other promising characters including one with an idol status and those dreamlike song entrances to boot. Other characters makes their appearances as well but all seems to be in the background. Even Maria from the original series seems to have a lesser role. I scratch my head several times whenever I think of this as a thought pops into my head: There's a butler with a star role, what about the maid? The artwork from this series is a joke. No, it's not even a parody because it's portrayed as a joke, in the wrong way. “Can't take my eyes off of you?” I can barely look at some of the characters' design from this series. Hayate looks like a bishounen more than he should be. Hell, he's like a trap now. The rest of the characters' designs aren't too different either. They all have identical heads with different colored hair attached to their bodies. In other words, it doesn't work out right. Most of the background colors are also quite generic and weak. A bit of an improvement to the artwork would have been much better to be honest. Luckily, the soundtrack of the series works well from my perspective. Although nothing special, "CAN'T TAKE MY EYES OFF YOU" by eyelis actually fits and presents some of that Hayate-like feeling of pleasant nostologia. The OST of the series so is just average but the insert songs from a certain idol shake things up. The ED song,"Koi no Wana by Haruka Yamazaki, performed from that same girl is presented quite well in the form of metamorphic art and style. Not too shabby. Ultimately, watching Hayate no Gotoku! Can't Take My Eyes Off You is like trying out for a sports team at a new school. You think everything might go your way but it might turn out otherwise. Whether the result pleases you will be different for everyone. Some of you might not take your eyes off of the series while others hit that drop button without a moment of hesitation. I'm sort of in the middle. At times, I snooze and lose the thought of enjoying the series. At other times, I get a pleasant feeling of watching it through. But overall, the decision is up to you to decide if you will enjoy this new and latest installation of the Hayate franchise. I mean, it-it's not like I want you to watch this series or anything!